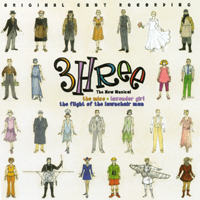 The one-act musical "Lavender Girl" (one of the segments of URBAN MYTHS, John's full length musical), with songs by John and a book by Los Angeles playwright James Waedekin, has become a part of a show called 3HREE. Put together by famed Broadway director Harold Prince, the evening features 3 short musicals, each by a different writing team and a different director (the third piece is directed by Mr. Prince himself.) The “Lavender Girl” segment is directed by Scott Schwartz, who has been involved with URBAN MYTHS since its inception. 3HREE had its first production at the Prince Theater in Philadelphia (John's birthplace) in the fall of 2000 where it got rave reviews in both the local papers and the New York Times. It had a second production at the Ahmanson Theater in Los Angeles. A cast album on DRG Records is now available through this website.